Hauoli La Hanau, e Kaleiohawaii! 1877. 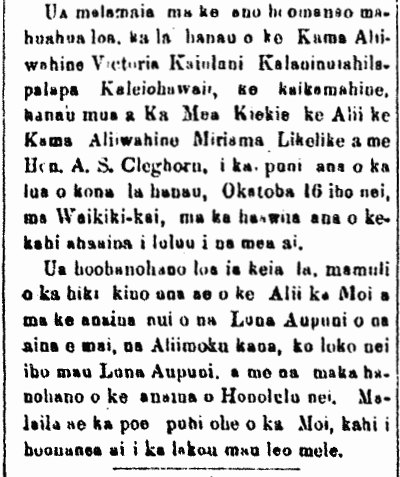 Held with much celebration was the birthday of the Princess Victoria Kaiulani Kalaninuiahilapalapa Kaleiohawaii, the first-born daughter of Her Highness the Alii the Princess Miriam Likelike and Hon. A. S. Cleghorn, on her second birthday, on this past October 16th, at Waikiki Kai, by way of the holding of a banquet laden with much food. This day was greatly honored by the arrival of the Alii, the King, and by the great attendance of the Officers from foreign nations, the Captains of the warships, the domestic Officers, and the prominent ones of Honolulu nei. Also present was the band of the King, which entertained folks with their songs. Ka Nupepa Kuokoa, Buke XVI, Helu 42, Aoao 2. Okatoba 20, 1877.